Dihydrate is the standard phosphoric acid process and is adaptable to a wide-range of phosphate rocks. Plants have been constructed using this process, in capacities over 3,000 t/d P2O5. Central-Prayon Process is a two-stage dihydrate-hemihydrate process. This high efficiency process, ± 98.5% cake efficiency, also produces a relatively strong acid, ± 36% P2O5. The process produces a “self-drying” gypsum that can be suitable for plaster board. Hemihydrate – is a simple one-reactor, one-filter process. The process produces a stronger acid ± 40% P2O5, with a slight penalty on recovery. The process is suitable where the rock cost is low but energy cost is high. Hemi-dihydrate – is the most complex process but also produces the highest concentration filter acid and has the highest instantaneous recovery. Phosphoric acid is concentrated in an evaporator heated by low-pressure steam and operating under partial vacuum. KEMWorks offers designs for forced-circulation evaporators with carbon or alloy heat exchangers. The vacuum system is designed so that no vacuum pump or steam ejectors are required. Fluorine may be recovered from the evaporators to produce fluorosilicic acid (FSA) at up to 25% H2SiF6. 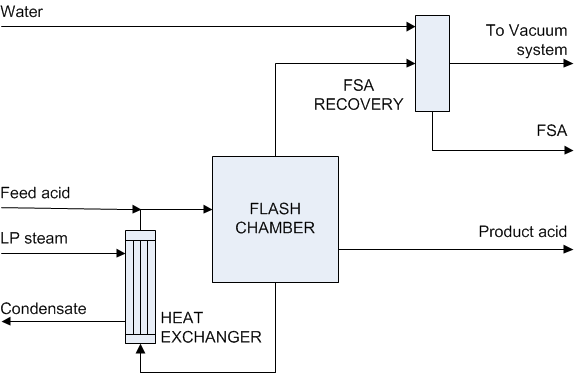 A batch process is used, which enables FSA to be recovered at very high recovery and with as low as 100 ppm P2O5 contamination. FSA is the base for a variety of fluoride products. Read more about fluoride products. The Improved Hard Process (IHP) is a kiln-based phosphoric acid process currently being developed by JDCPhosphate. It would have major environmental and sustainability advantages over wet acid process acid routes for low-grade phosphate ores. It produces a high quality phosphoric acid suitable for liquid fertilizers that allow more efficient utilization in crops. The Improved Hard Process may offer capital and operating cost advantages over the wet acid process for low-grade ores. KEMWorks has provided a third-party review of the process and can provide you with an assessment of its suitability for your phosphate and your particular site conditions. See this at JDCPhosphates’ website.. The Research and Development Department of the J. R. Simplot Company has successfully developed a membrane based system for the purification of wet process phosphoric acid after four years of intensive research. A first-of-a-kind, 30,000 t/y solution purification plant using this technology successfully started up in 1996 to produce high quality Technical Grade Acid suitable for fertigation and other industrial purposes. A high value added product is manufactured from wet process phosphoric acid. No solvents are used in the process. Only by-product is a raffinate acid stream. Produces a technical grade acid. Available through a licensing agreement with KEMWorks Technology. Process is flexible – high levels of product quality can be met through multiple stages of membrane filtration. Simple, easy to operate process.